CESSDA stands for Consortium of European Social Science Data Archives and ERIC stands for European Research Infrastructure Consortium. 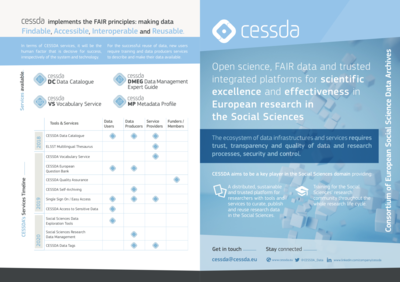 CESSDA provides large-scale, integrated and sustainable data services to the social sciences. It brings together social science data archives across Europe, with the aim of promoting the results of social science research and supporting national and international research and cooperation. CESSDA builds trust in social science research by ensuring its quality and that it is available for future research. By acquiring the status of a trust repository, CESSDA Service Providers demonstrate their reliability to researchers as well as national and international research funders. CESSDA supports continuous learning and training of its Service Provider staff and the social science user community. The areas covered include research data management, data discovery and reuse, digital preservation and data archiving, as well as CESSDA tools and services. Technology refers to the technical infrastructure behind CESSDA that ensures a stable and up-to-date backbone for our products and services, making it simple and easy to both deposit and access data.